I hope you liked the mix from James N Murray. So far this year I've been able to read at least two books a week, but this week struggled through Don DeLillo's The Names. It was a challenge. I enjoyed it more than the last DDL I read though (Point Omega, which nonetheless left me with a permanent vision of a slowed-down, 24-hour-long screening of Psycho). On to another one now, this time it's Nowhere People by Paulo Scott. I mainly clicked this cause it's called 3.2, which happens to be the same name as a favourite track of mine. The music seriously bangs, though. The first track incorporates everything from the rhythms of Bristolian "bass music" and what could be an orchestra tuning up before a brief spoken breakdown leads into clattering 'Think' breaks and exciting melodies. The second is darker, less dramatic but more powerful in some ways. Syncopated melodies and yawning vocals appear as percussive patterns switch between half-time and full-throttle rhythms. As I said, it bangs. I must admit I was incredulous when this popped up on my radar. Established artist turns to ambient, "without any agenda outside of representing the self, not geared toward the dancefloor or a specific environment but simply a bi-product of introspective exploration". I gave it a shot though and I must admit it's a really special album. It reminds me of Talbot Fade's stuff in how it stretches out and really pulls at your most emotive fibres without mercy. I listened to it on my way to and from a funeral when the snow was at its height and it felt perfectly appropriate. There's one track that seems out of place with its beats and guitar, but halfway through its 10 minutes it becomes a wall of echoed reverb. Just marvellous. 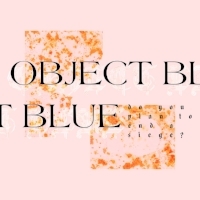 London-based object blue featured in Bandcloud last year with a stupendous live show. This here is her first official release and comes on Tobago Tracks. 'Even In You' grows slowly, curious murmurs hovering over stark hi-hats before a hefty kick-drum lands, preceding strange digital coughs and human gasps. Glitches trip and fall, sounds filtered into a state of confusion. 'Act Like It Then' is far more direct, opening with a flurry of strange noise and that same kick as whirlwinds of noise surround an unintelligible Cardi B sample. Finally, 'Cerco de Deus' is the siege of the title, manifesting the artist's fascination with arcane religious imagery. Rattling percussion sounds like galloping horses, a lilting theme belying the track's frantic intensity. 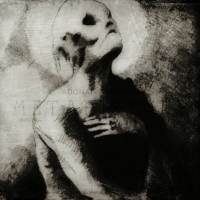 This one's a sad and languid dark ambient album with some phenomenal artwork. Just look at it! It's driven by a strange pulse, particularly the lengthy 'Al Awwal', with its steady lurch and wailed vocals. We've also got detuned speech, choral chanting and all-encompassing dread, coming together to make you question your own existence. Fun! 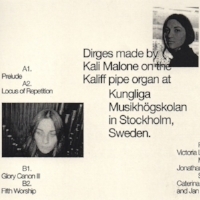 Here we have some beautifully mournful plaintive organ music from Kali Malone, a young artist from Colorado who's now based in Stockholm. I accidentally skipped back a few minutes in this track and wasn't even mad, just happy to listen to more of its slow developments. I heard a release from her last year but missed something she did with Caterina Barbieri — always learning. If anyone wants to buy me this tape I would be more than happy to accept such a gift. 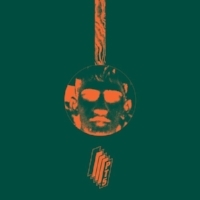 FOOZOOL just did a track with 8ULENTINA for the latest Physically Sick comp from Allergy Season/DISCWOMAN compilation (a must-buy, if you didn't already know), then put this collab with Nihar up on SoundCloud. It's a banger. Growling techno noise. Heavily effected vocal samples. Annoying siren-like wails. Snarling drum rolls. Eight minutes of righteous anger baby. I think it's named after Armenian singer Ofelya Hambardzumyan, who I believe is pictured right. Gadget & The Cloud is the solo project of Kelly Doherty, a Cork-based artist who's appeared in Bandcloud a few times over the years. One such inclusion was in late 2016 for '3600 Seconds', which appears as the opening track here. A DJ set in four minutes, it covers a host of styles and sets the tone for the album. The tracks on show here are alternately exciting and introverted, as befitting the title. 'So Shy', for example, is bright like the music from a boohoo.com ad, yet it's still quietly melancholic. Its inverse follows in 'Continue', with almost reversed melodies drifting over a strange shuffling beat. 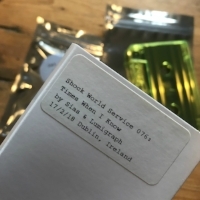 Dublin's Sias and Lumigraph put together something incredibly special for the Shock World Service (full disclosure: I've mixed one previously too). This mix was a collection of songs, ideas, thoughts, lovingly gathered together in a musical bindle of sorts. I tweeted on first listen that it was recognisably Irish without being "twee" or "Oirish". A kind of modern Irishness pervades. Shock has put together a limited series of tapes, each specially packaged and coming with a selection of photos taken by the two guys. The top image in this mail comes from that collection.